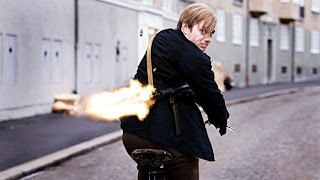 The Norwegian resistance movement is the subject of this big budgeted sprawling co-production treatment. Clearly this an important story to Norwegians - the true tale of a group of youngsters, turned commando terrorists who, over the course of 5 years, manage to help turn the tide of war. It’s a noble effort featuring some fine young actors playing their roles with honour and dignity, but there’s too much story in a too short a time resulting in a cinematic dilution of emotion and suspense. Max Manus (Aksel Hennie) is introduced fighting for Norway against the German invasion in a raucous battle scene in the snow. Max tells us in voiceover the embarrassment of his country’s quick surrender fueled his desire to fight even harder against the Nazis. We watch Max form a résistance group of likeminded young people, who produce propaganda papers with as much zeal as a group of frat kids. But when their carelessness finds Max caught by the Gestapo, the reality of their actions becomes quickly apparent. Max manages to escape and regroup in Scotland where he’s trained as a commando to work in the large Allied-coordinated resistance movement. His missions involve planting bombs on boats and buildings under the noses of the Nazis. Max becomes so good at what he does he becomes a legend within the Nazi SS, who are determined to find him. One by one his fellow warriors and good friends are hunted down and killed leaving only Max to put the final nail in the coffin for the Nazis. There’s nothing false in “Max Manus” yet the film remains at a distance too far for the audience to be intimately invested in the emotions of these events. It’s the ‘hopscotching’ effect of skipping through the highlights of the five years over which the film takes place. In the first 15mins we meet Max, see him as a soldier on the front, get injured, start up a resistance, develop a propaganda newspaper, get caught, escape and join up with the Allies in Scotland. Scenes are just too short to enjoy and the filmmakers even resort to annoying narration to fill in the details of what the montage scenes can’t. Thankfully they discard the device when it’s not longer necessary. In skipping too fast between locations, we never feel the threat against Max and his fighters. One moment they’re planting a bomb underneath a battleship and the next moment they’re in Sweden or Scotland sipping whisky. Perhaps some dramatic licence was needed to keep the characters under the pressure cooker of undercover terrorism - the set pieces in ‘Valkyre’ or ‘Munich’ serving as the best cinematic examples. Other opportunities are missed all over the place as well, chiefly the parallel stories of Max Manus and his foil Siegfried, the chief Nazi SS man. By the nature of the editing pattern there would appear to be some sort of ‘Catch Me If You Can’ cat and mouse chase going on, but never does one influence the other. Looking carefully Siegfried actually has no tangible narrative purpose and could have been cut out altogether without harm to the story. And even if Siegfried were weaved in appropriately there’s much screen time devoted to some romance between he and his secretary, which inexplicably disappears before the third act. The only respite comes, unfortunately, in the final credits when we see photographs of the real life characters next to the actors' faces - not an original device, but one which finally anchors down the reality of the story. It’s too little too late, because the filmmakers have missed this potentially thrilling story with uninspired and only adequate storytelling.